California prison inmates engaged in a nearly two-week-long hunger-strike say that jailers are beginning to retaliate for what has become an item of embarrassment for state officials. At least 1,457 inmates across the state of California remained engaged in an act of civil disobedience on Thursday as a historic hunger-strike aimed to raise awareness of deplorable prison conditions approached its twelfth day. That number has dwindled down from 30,000 in 33 jails just a few days ago, however, and allegations made by prisoners about the guards’ efforts to persuade inmates against protesting could provide an explanation why. Attorneys for the inmates say prison officials have retaliated in hopes of ending the hunger-strike that started off on-track to be the largest the state has ever seen. According to lawyers, California Department of Corrections and Rehabilitation guards are blasting ice-cold air into the cells of inmates, confiscating legal documents and ever barring some attorneys from making contact with their clients. “The CDCR wants to cut off communications between prisoners and the outside world, but we are not going to let that happen,” attorney Marilyn McMahon, who represents an inmate at Pelican Bay State Prison, wrote in a statement issued Thursday. Inmates across the state are protesting the prison system’s tactic of isolating detainees who have been determined to be involved in internal gangs. Those prisoners are locked up in small, solitary cells until they volunteer to detail gang activity to investigators. No rule exists limiting how long those inmates can be held in isolation, and some have lived like that for years, even decades. “Our indefinite isolation here is both inhumane and illegal, and the proponents of the prison industrial complex are hoping that their campaign to dehumanize us has succeeded to the degree that you don’t care and will allow the torture to continue in your name,” inmates at Corcoran State Prison said in a statement issued earlier this month. The inmates want the state to adopt a maximum isolation term of five years, as well as provide education and rehabilitation programs and the right to make monthly phone calls. But despite raising awareness across the country in under two weeks through the stunt, guards are apparently retaliating in an attempt to weaken the movement. But while CDCR spokesperson Terry Thornton insisted to the Guardian that the temperature within the prisons are at a normal, appropriate level, attorneys say the CDCR is deploying even more sinister tactics to try and break down the strike. Strikes at Corcoran, Pelican Bay and more than 30 others have been underway July 8. A similar hunger-strike that was waged two years ago in California with more than 6,000 participants prompted a class-action lawsuit which is still being deliberated today. The latest action also comes amidst a handful of other local scandals that have marred the CDCR involving issues of overcrowding and the mass sterilization of female inmates. 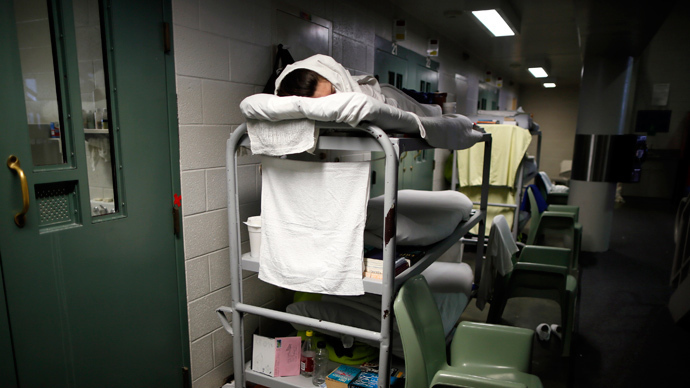 ‹ Will California prison hunger strike lead to Gitmo-style force-feeding?